Today, we ventured out to the fairgrounds for the annual Wake County Library Book Sale. All the books for sale have either been donated or removed from library shelves in the last year. There were lots of free and fun activities to entertain the kids today, including a magic show, a juggler on stilts, and Irish dancers. Books prices today were $1 for children and paperback books and $2 for hardback. 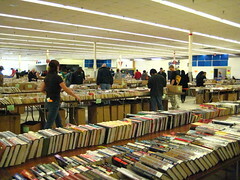 Tomorrow is the big bargain day though $2 for bags of books and $5 for boxes of books. There were lots of kids books, but they seemed pretty picked over. However, there were tons of paperback fiction, textbooks, cookbooks, history books, biographies and more when we left this afternoon. There was enough of a selection that folks were able to put together whole series' (i.e. Lord of the Rings). So, if you like to read, go grab a box. I'll summarize the event with the words of my husband. "This was cool. Make sure you put this on the calendar for next year."